You can listen to 'Dark sea' here. Recently we presented some louder albums, so it's time to wind down and cater our viewers with a bit more mellow taste. If this appeals to you, Forever so may be just the sort of album for you to check out. That does not mean that this is a pushover, knockout pop album. 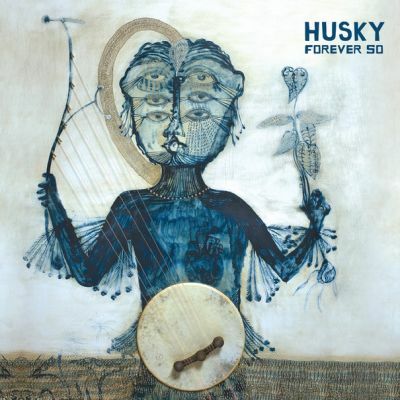 No, Husky's searching for inner beauty and serenity, but not necessarily through the easiest of arrangement and phrasings. 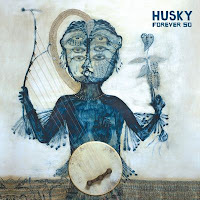 Husky is a band from Melbourne in Australia around singer/guitarist Husky Gawenda. Forever so its first album. The band was signed to the famous Seattle label Sub Pop Records as first Australian band. Listening to the music this is not the strangest of things, as The Shins, one of Sub Pop's gems is the first band that comes to mind listening to Husky. There are three elements at the basis of this album. The soft, high voice of Gawenda, who sings like there is no train to catch, is one. Acoustic sounds is the second. Electronics are used sparsely as embellishments only. Thirdly, harmony singing and oohs and aahs make up the fabric of Husky's songs. The band also has listened to Mumford & Sons. The influence clearly shines through in 'History's door' and 'Hunderd dollar suit' in the way the notes cascade in the background, not in the way of presentation. Husky is far more relaxed. 'The woods' shows how good these guys can sing together. Gideon Preiss' piano sounds beautiful. Clear notes around the chords fill the song up in great way. Most songs have an element that distinguishes itself. An acoustic guitar, a piano, but also an instrument like a wood block at the back seeping through the mix. Husky worked on the arrangements, making them stand out. Forever so did not instantly distinguish itself to me. It crept up slowly. The songs are not the kind that endear themselves automatically. I had to make an effort to get to know the songs and appreciate them more. Some of them are a bit prickly, perhaps through a process of deconstruction and rebuilding a song in a different arrangement that was less obvious then the original version. The tempo different. Who knows? 'Dark sea' e.g. is not a song that does not give away it's beauty in one go. Forever so grew on me and is by now in medium rotation. More than enough to deserve a review. All in all the album has a clear pop influence, but presented with a big twist. There are elements of folk and singer-songwriter in a band setting. And very faint traces of psychedelia, most obvious in the aptly called 'Instrumental'. 'How do you feel' has quite a trippy vibe. Enough differences to make an album interesting and Forever so has this quality in abundance. There's enough going on to make the medium to slow paced songs worth while to listen to repeatedly. As interesting as the sleeve art promises. What is it that I see, what is it that I'm listening to?